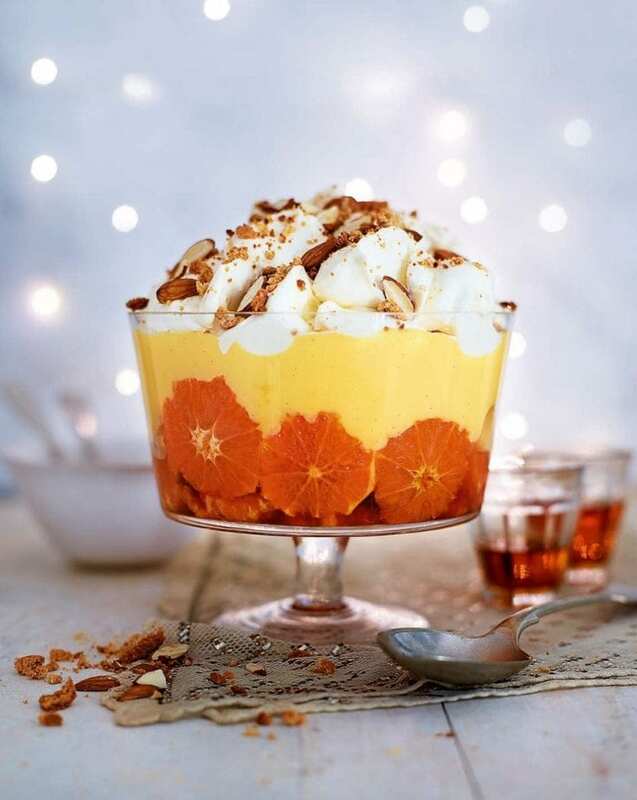 Make this ultimate trifle recipe with soft sponge, caramelised clementines, thick custard, cream and an amaretto crunch. mixer in a large bowl until light and fluffy. Beat in the 2 whole eggs, one by one. Fold in the flour and ground almonds, then pour the mixture into the tin. Bake for 15-18 minutes until a skewer pushed into the centre comes out dry. Cool in the tin for 5 minutes, then turn out onto a rack to cool. For the custard, put the milk and the 175ml cream in a non-stick pan with the vanilla seeds and pod. Bring to the boil. In a bowl, whisk the egg yolks and golden caster sugar using a balloon whisk until pale and thick. Whisk in the cornflour. Gradually pour over the hot milk mixture and whisk until smooth. Return to the cleaned pan and cook over a low heat, stirring, until very thick and glossy. Don’t let it boil, but let it get thicker than you think it needs to be; you should be able to see the bottom of the pan as you stir (it could take 10 minutes). Pour into a bowl and press cling film onto the surface. Cool, then chill. Slice the ends off the clementines and peel with a serrated knife, then cut into 0.5cm thick rounds. Melt the 50g caster sugar with 2 tbsp water in a large pan. Without stirring, turn up the heat and bubble until golden and syrupy. Stir in the 4 tbsp amaretto; it may seize (harden) but will melt again. Take off the heat, add the fruit and leave to macerate for 15 minutes or up to 24 hours. Strain the fruit (keep the syrup) and arrange in the base and up the sides (1 slice high) of a 1.5 litre trifle dish. Trim the sponge to fit on top, drizzle over as much syrup as you like, then spoon on the custard. Just before serving, whip the amaretto cream ingredients with a balloon whisk to just short of soft peaks, then spoon on top of the custard. Crumble over the amaretti biscuits, sprinkle on the almonds, then serve. Next time, try sliced pears or apples with brandy or calvados and toasted hazelnuts. Make the sponge up to 3 days ahead and store in an airtight container, or wrap and freeze for up to 3 months, then thaw. Macerate the clementines in the caramel for up to 24 hours. Make the custard up to 24 hours in advance and chill. Assemble the trifle up to the end of step 5 a few hours in advance, press cling film on the surface and chill. Whisk leftover egg whites with a pinch of sugar and freezer in a freezer bag for up to 3 months. Thaw and use for meringues or royal icing. How many of these round-the-world Christmas traditions have you tried?